is one of the most important decisions that one can make. Lighting is often more expensive than the tank and stand if it’s done properly. Choosing amongst all of the LED options on the market can be overwhelming for the beginner, confusing for the average hobbyist and even difficult for experienced aquarists. Fortunately by arming yourself with some basic knowledge of LED lighting you can sift through the mountains of data and decipher the facts to arrive at the best possible choice for your aquarium. If a light gives good coverage it often does it at the sacrifice of intensity (PAR). Getting good coverage is done through the use of wide angle lenses or even forgoing the lens altogether. This allows a fixture to cover large amounts of area but typically at lower amounts of PAR. 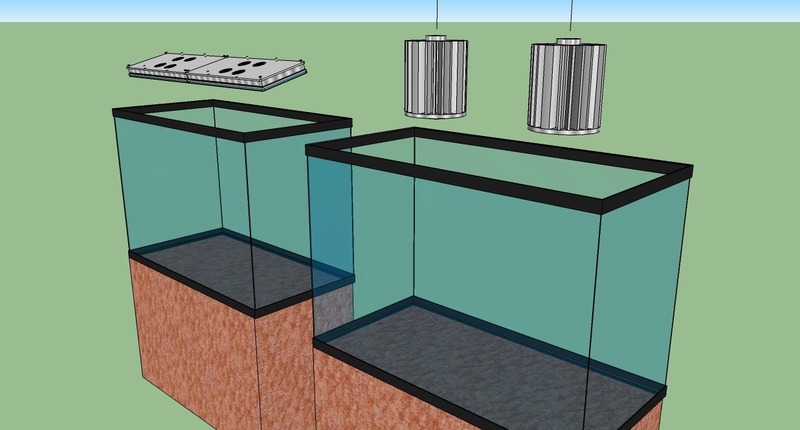 This is acceptable for frag tanks and refugiums but not for our normal size display tanks. Finding a fixture that delivers both coverage and PAR will give you the best opportunity to have a useful fixture that will provide the intensity required for SPS corals. Denser corals with many polyps require a higher amount of intensity in order to get more light into the colony and prevent die off of the backside and bottom of the colony. As a new tank progresses and corals get larger you may have to change lighting in order to get the intensity that you need if you don’t select proper lighting from the beginning. Getting good coverage while avoiding hot spots due to poorly designed fixtures is critical to a well thought out lighting plan. Doing things right the first time is far cheaper than doing things a second time and this is where the spousal factor can really become apparent. There are nearly as many features available as there are lights on the market. Many of these features are useful but many of them are gimmicks that are designed to entice buyers with no real benefit for the corals or ecosystems. A simple light with the perfect spectrum will always be better than a feature packed light with poor spectrum. Dimming- a useful feature that provides a nearly seamless sunrise/sunset, full day cycle just like corals and fish would experience in the wild. Dimming also allows for intensities to be raised over time, as needed, as a reef matures and fills in. If your fixture is being used at 100% from the beginning there is no room to grow and the only way to increase intensity is to add fixtures. Pre-Programmed Modes- another useful addition to help hobbyists get up and running quickly after installation. They can also be used to help build a custom program by using the preprogrammed mode and building upon that. Most experienced hobbyists and all professionals install custom lighting programs that fit the needs of the tank inhabitants and the owners viewing time schedule. Wireless control- This one is all about the user. Your corals and fish do not care if a fixture is wireless. Having a fixture that is wireless can give you better options for control and programming. Typically wireless fixtures allow you to program multiple units at the same time which is much better than doing one at a time. Wireless allows you to step back and look at the tank from a short distance and make adjustments that look good to you. Individual LED control- Being able to turn on only the red or greens may sound like a good idea but there is no need for this in a well-designed system. This is something that you will only do when you first get the fixture and once you have established a routine for your system you will not want to change the lighting in this fashion. Cloud functions- can be a useful feature to give corals a brief respite during the day allowing them a small time of lower light from the high intensities of the full daylight cycle. These are also a bit of a toy for the user to play with. Lightning or Storm mode – this mode is for the user only. Corals typically shrink up and fish hide during storms to avoid being damaged or swept away from their home area. In the home aquaria fish will hide as soon as the lights begin to flash. Fishes such as wrasses and firefish will often jump out of the tank due to being startled. This can lead to expensive fish replacement if they do not survive the experience. Dance Mode/Disco Mode- Pure and simple gimmick. There is no need for this on a reef tank lighting system and it can be more detrimental than anything else even when it’s just used to demonstrate the lighting to your fellow hobbyists. *Another quick note on dimming, lightning and cloud functions. Anytime that your lighting makes a change that is drastic it will attract the attention of anyone in the room. If you are watching a movie and the lightning mode begins it will distract you from what you are doing and can be more of an annoyance than an enhancement. This is why a gradual dimming cycle or a gentle cloud feature is better than drastic fast changes. The average user disables this mode shortly after they install the fixtures for this exact reason. Be sure that you understand the total spectral characteristics of any given fixture and not just reposted data from the manufacturer of the individual diodes. Fixtures that avoid the use of Green and low kelvin white LEDs. They only add to the spectrum that grows algae. They are used due to their cost, availability and to exaggerate the PAR reading as green LEDs do provide a high PAR but offer almost no useful light for coral growth. Now that you have a basic understanding of how to research and select fixtures it’s time to figure out which fixture best suits your tank. This largely depends on your needs overall. For the remainder of this article we will focus on several examples to help a wide assortment of users with common fixture type applications. All dimensions are Length x Width x Height. If your tank is not listed then we suggest using the closest fit in length as a starting point. We also offer free consultation for any project and one of our customer service reps will be more than happy to assist you with planning. Tank 1- 180 gallon display tank with dimensions of 72 inches x 24 inches x 24 inches. This is a mixed reef with a wide variety of corals. Orphek ATLANTIK – 2 units. This full size Atlantik offers excellent coverage and enough intensity to provide for SPS corals at even the deepest part of the tank. 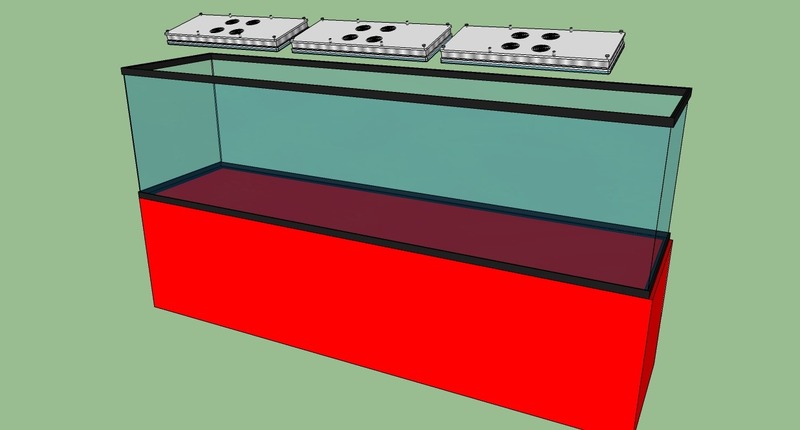 The light will be able to run at 75% of full intensity allowing the user to increase the light as needed to dial in to the needs of the corals as the tank matures. Tank 2- 120 gallon display tank with dimensions of 48 inches x 24 inches x 24 inches. This is a mixed reef that has more SPS corals than other species. Option 1– Atlantik Compact– 2 units. This will offer the user the same 4 channels of control, the same spectrum and the same penetration as the full size Atlantik but enable them to separate the lights giving more consistent spread across the tank. The two units together equal 260 watts which is more than the 190 watts of the standard Atlantik which will enable higher light intensities to provide for the SPS corals throughout the entire tank. Option 2– Orphek ATLANTIK – 1 unit. This will cover the tank and give enough light for SPS corals to be housed in the majority of the tank with the outermost edges available for LPS and soft corals. 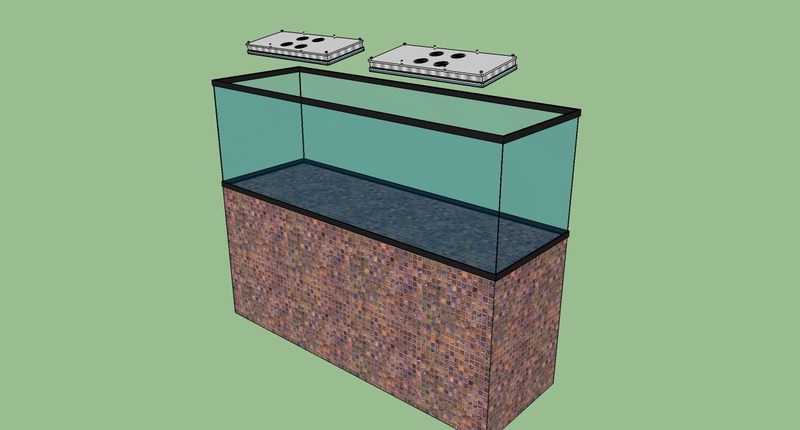 Tank 3- 60 gallon cube with the dimensions 24 inches x 24 inches x 24 inches. Option 1– Atlantik Compact– 1 unit. This will offer plenty of light for SPS corals, wifi control along with full dimming and programming. 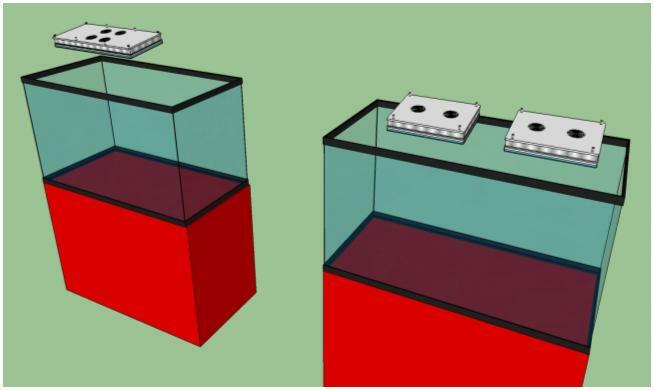 The compact will also be useful for future tank upgrades and will transfer well to larger display tanks. Option 2– PR72– 1 unit. 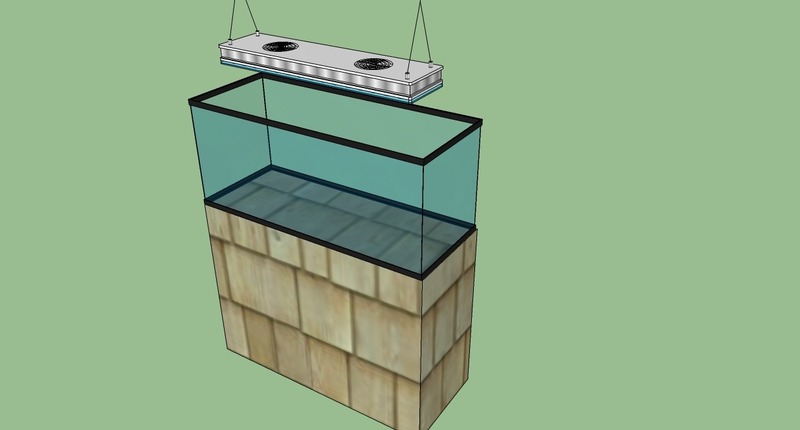 This pendant style light will need to be mounted higher to provide full coverage and is capable of providing light for a mixed reef with SPS corals in the top half of the tank closer to the light. With Dimming via the prewired RJ45 plug the unit can be controlled via an APEX or other similar aftermarket controller using 0-10v dimming. Tank 4- 55 Gallon display with dimensions of 48 inches x 13 inches x 21 inches. Option 1– PR156– 2 units. This is Orphek original flagship model. Offering high levels of par and coverage for narrow tanks like the 55 gallon. The unit operates via 2 timers and features upgraded meanwell drivers to improve light consistency over the lifetime of the fixture. Option 2– PR72– 2 units. These will cover the tank and provide for corals with enough light to thrive and color well. The coverage area of the lights compliments the narrow length of the 55 gallon tank. Tank 5- 40 gallon breeder tank with dimensions of 36 inches x 18 inches x 16 inches. Option 1– PR72– 1 unit. This will need to be mounted higher to cover the tank and corals will need to be placed accordingly with higher light corals at the center and lower light corals around the edges of the coverage. The unit provides excellent spectrum for good growth and color. Option 2– Atlantik Compact– 1 unit- This is the high light option. The Atlantik Compact is a great option for this size tank as it will cover fully and the depth of the breeder makes for easy intensity adjustments. You will only need to run the unit at 50%-75%. Tank 6- 28 gallon nano tank with dimensions of 18 inches x 22 inches x 22 inches. Option 1– NR12– 1 unit. This is the lower light option and can be used for lower light corals such as zoas and some LPS. The light offers the Orphek spectrum in a smaller package. Option 2– NR12– 2 units. 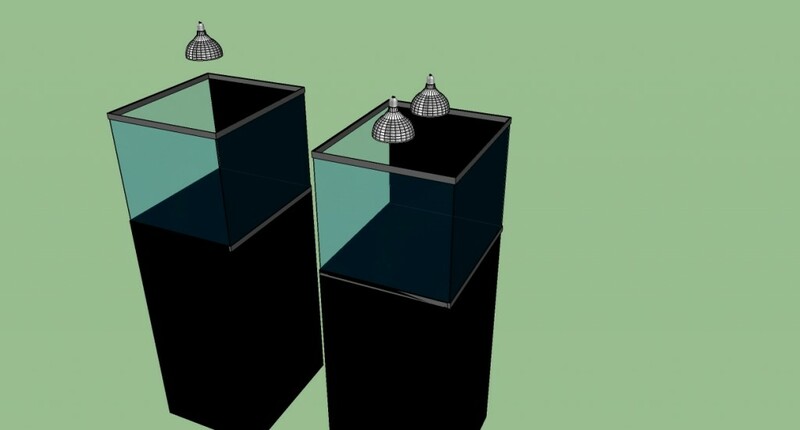 This will double the amount of light in the tank and will allow for SPS and higher light corals to thrive. The coverage would be the same on both lights but they will work together to double the par in the tank. Tank 7- 29 gallon tank with the dimensions 30 inches x 12 inches x 18 inches. PR156– 1 unit. This is light is the perfect fit for this tank for coverage. 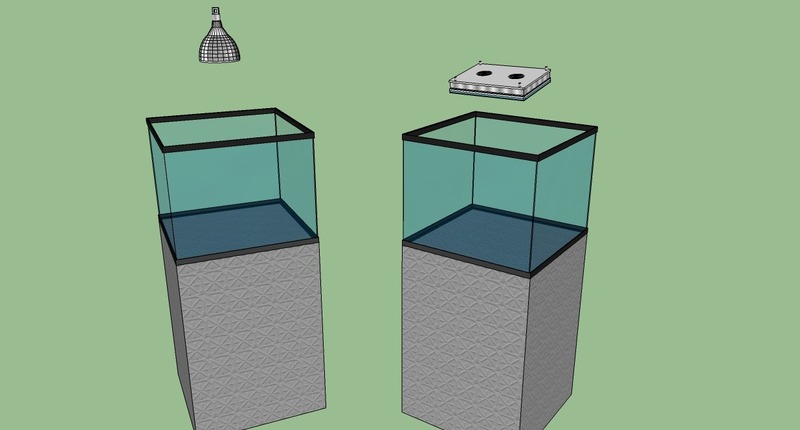 Mounting should be at 14-18 inches above the water to help to reduce the PAR throughout the tank. High light corals will do well and lower light corals will need to be placed carefully. The four blue moonlights will offer a great evening glow to the tank after lights out. Tank 8- 150 gallon Tall tank with dimensions 48 inches x 24 inches x 31 inches. Option 1–Orphek ATLANTIK – 2 units. 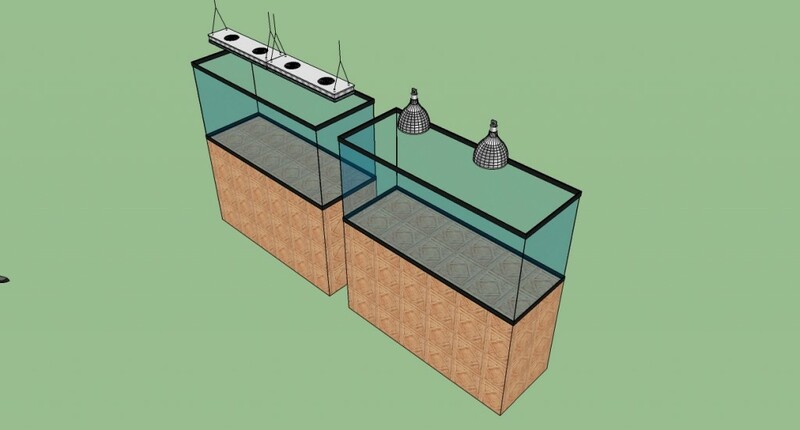 This will provide coverage and the intensities needed to provide for all corals at depth. The Atlantik wide is capable of covering tanks of depths up to 40 inches making the 31 inch depth of this tank easy. Option 2– ATlantik Pendant Wifi – 2 units. The Atlantik -P will provide all the power and spectrum necessary for Corals growth and color. This will offer plenty of light for SPS corals, wifi control along with full dimming and programming. 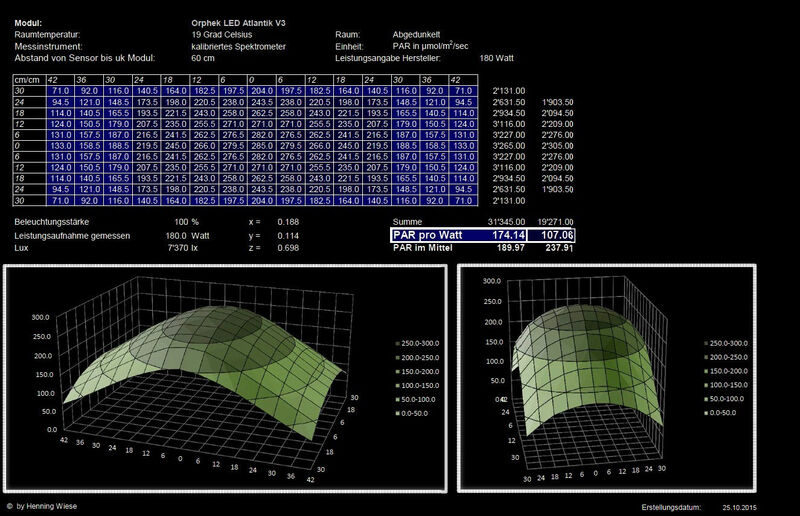 Simulating the look of metal halide while offering the cost benefits of Atlantik -P is good at. Tank 9- 240 gallon display with the dimensions 96 inches x 24 inches x 24 inches. Option 1-Orphek ATLANTIK – 3 units. 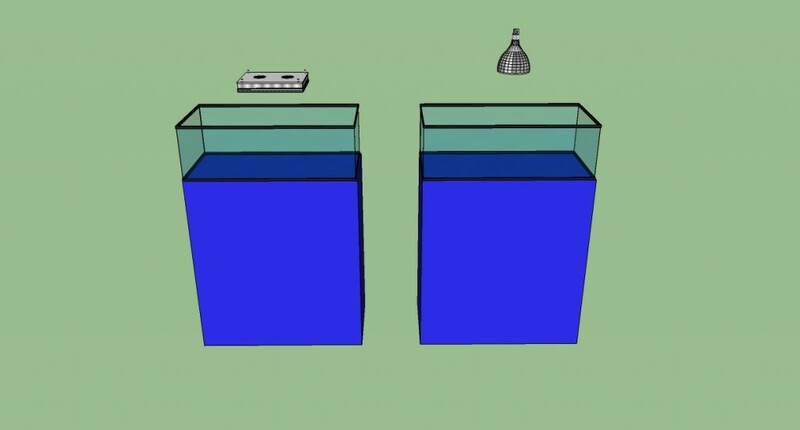 Covering the tank from end to end consistently becomes more of a challenge as the length of the tank increases. The size of the Atlantik enables them to cover more area consistently with less fixtures. Smaller fixtures using more lights can be harder to use and cover the tank with a consistent look. Option 2- ATlantik Pendant Wifi – 4-5 units. The Atlantik -P’s ability to cover large areas at depth lends itself to larger tanks such as this one. Mounting the units higher will allow for easy access and consistent lighting throughout. Tank 10- 600 gallon display with dimensions of 96 inches x 48 inches x 30 inches. Option 1-Orphek ATLANTIK – 6 units. Easily covering this size of a tank the Atlantik is able to deliver both growth and color to even the highest corals at depth. Communicating with 6 units via the integrated wifi control will make programming and changes a snap. Option 2- ATlantik Pendant Wifi– 8 units. 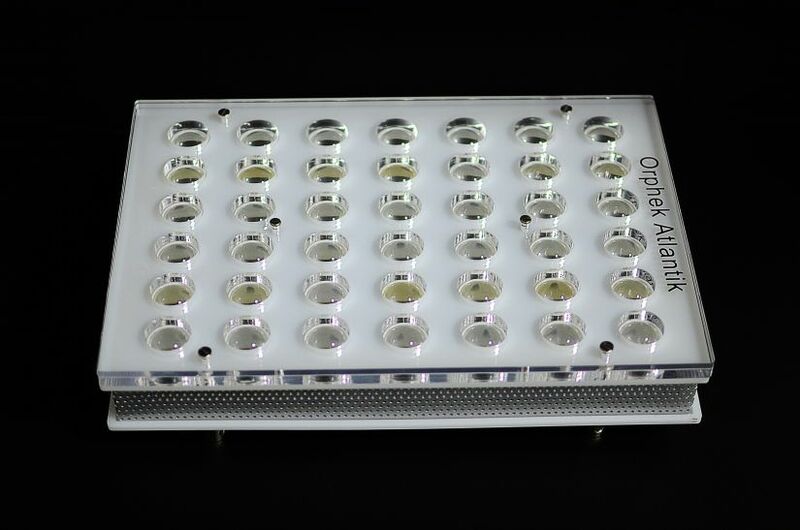 The Atlantik -P unit will give excellent growth patterns by mimicking metal halide lighting. Many clients cannot tell the difference without knowing what the light source is ahead of time. Multiple fixtures will allow light to penetrate and surround corals improving color throughout the colonies. The The Atlantik -P unit also delivers consistent light across the tank and the program Wifi means that it is dimmable giving you the ability to control the intensity and to simulate sunrise/sunset.